IAIA19 information–only 3 weeks left to register! 1. IAIA 19 information—only 3 weeks left to register! The preliminary program is available online. Register today—only 3 weeks left! Join 812 of your colleagues who have already registered for the engaging discussion on the future of IA, and don’t miss this opportunity to meet and welcome IAIA’s new Executive Director, David Bancroft, at his first IAIA annual conference. Registration is open through 5 April. Training courses, technical visits, and other events: Some events are selling out, but if you act fast, you can still register through 5 April—on-site registration will not be available. Sponsorship opportunities are still available for IAIA19. Download the sponsorship opportunities brochure to learn more about sponsor benefits and how you can make your company visible at IAIA19. Thank you to the following organizations who have already committed to sponsor IAIA19: Tourism and Events Queensland, Brisbane Marketing, ExxonMobil PNG Limited, Canadian Environmental Assessment Agency, NORAD, Cardno, Oceana Gold, Chiba University of Commerce, Prizma, LLC, World Bank Group, Asian Development Bank, Australian Aid, Japan International Cooperation Agency, Wood, Millennium Challenge Corporation, and Inland Rail - Australian Rail Track Corporation, SEMADET Jalisco, European Investment Bank. Join us for a free 45-minute webinar on 28 March with Josh Fothergill for a launch of IAIA's new Compendium of National EIA Professional Recognition Schemes. The Compendium is the result of a 2017 Innovation Grant IAIA provided to IAIA members Josh Fothergill and Ross Marshall. The project has identified the current situation in over 70 countries around the world and uses data from over 20 country systems to identify trends and common elements between such registration schemes. The webinar is intended for anyone interested in how wider quality assurance is developing in and around EIA, including practitioners, researchers, national governments, and IFI safeguards personnel. Click for more information and to register. IAIA, together with CSIRO (Australia) and ITAS (Germany) will be co-sponsoring a SCIRO workshop, “Assessing the impacts of disruptive technologies,” in Brisbane on 3 May. This workshop for targeted invitees will bring together members of the Australian research community and global research communities working in the domains of impact assessment, technology assessment, and responsible innovation to exchange knowledge and grapple with the challenges related to assessing the impacts, risk, and opportunities of novel and disruptive technologies. The workshop will focus on knowledge exchange with a view to identifying future collaborative projects in this rapidly evolving field. Invitees will include international colleagues from IAIA, the Institute of Technology Assessment and System Analysis (Karlsruhe Institute of Technology, Germany), the Research Council of Norway, the VTT Technical Research Centre of Finland, and the Chinese Academy of Science and Technology for Development (Ministry of Science and Technology, China). Additional invitees are being sought. If you are an IA practitioners with serious interest in this topic, please contact Jiri Dusik. Jillian Ash (Australia) was selected as the recipient of this year’s Rita R. Hamm IA Excellence Scholarship. Jillian is a practitioner with GHD’s Engagement, Communication and Communities Global Service Line and the Social Impact Assessment technical discipline. The 2018 IAPA Best Paper Award will be announced in late March. Keynote speaker Mr. Deogratias Niyizonkiza, Charlie Wolf’s adopted son, talked about the life and times of Charlie Wolf and himself, stating that the environment is medicine and every action an individual takes should be toward preserving the environment. Guest speaker Dr. Ismail Idris spoke on the theme, focusing on what he believes are “six models of Green Economy”: water management, sustainable land use, climate smart agriculture, sustainable tourism, renewable energy, energy efficiency and sustainable technology; and he highlighted the drivers of information technology and green economy: legislation, entrepreneurship, talent, market potential, and investment opportunities. For a summary report, video, photos, and more information, see https://www.aeian.org/ or contact Ahmed Sanda. Contact Jennifer Howell at IAIA HQ to express your interest and receive information on preparing an effective proposal. Bids for IAIA21 are due 15 April 2019. Bridget John, IAIA’s Operations and Marketing Manager, has been promoted to Deputy Executive Director. This promotion is due to Bridget’s role over many years across finance, administration, programs and marketing. As IAIA plans for the future, having Bridget in a senior leadership position in HQ will facilitate the formal opening of an IAIA Executive Office in Washington, DC. California Association for Environmental Professionals (Associated Organization) is holding its statewide annual conference 24-27 March in Monterey, California, USA, with the theme “Waves of Change and Fields of Opportunity.” See https://www.califaep.org/conference for more information. 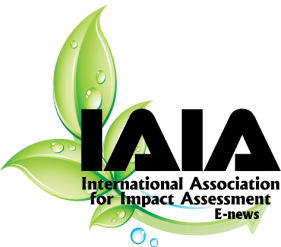 IAAZ (IAIA Zambia Affiliate): The Impact Assessment Association of Zambia (IAAZ) is convening an ESIA Indaba, training sessions, and their AGM in Livingstone, Zambia, from 25-29 March 2019. For more information, contact John Mutelembi (johnmutelembi@gmail.com) and Stella Kayope (sellivanak@gmail.com) or visit www.iaaz.org. AQEI (IAIA-Québec, Canada, Affiliate) Save the date for the 27th annual conference of the AQEI. 9-10 May 2019, Montréal Center-Ville, Québec, Canada. The theme will be devoted to the issue of inclusion in impact assessment. Information will be posted at https://www.aqei.qc.ca/ as it becomes available. IAIAsa (IAIA South African Affiliate): 2019 national conference: “The Role of Integrated Environmental Management in the Economic Revival of South Africa. 21-23 August 2019. Limpopo, South Africa. The call for pre- and post-conference training proposals is now open. Please submit all training proposals to operations@iaiasa.co.za by 15 February 2019. For more conference information: http://www.iaiasa.co.za/DisplayLink.aspx?group=Annual Conference&name=2019. APAI (IAIA-Portugal Affiliate) is a supporter of the 4th edition of the International Congress on Environmental Health (ICEH 2019), under the theme "New Challenges for the Future,” organized by the Lisbon School of Health Technology (ESTS-IPL) and by APSAi (Portuguese Association of Environmental Health). The event will take place in Lisbon, Portugal, 25-27 September 2019. See https://iceh2019.estesl.ipl.pt/ for more information.